Buildium Review - Is It the Best Property Management Software? Buildium review and rating - Buildium is certainly well known among landlords and property managers, but does live up to its fame? Find out the answer here. Propertydo.com may be compensated through the links in the post below, but the opinions are our own. Given the reputation, we were expecting a lot from it. We're pleased to say that Buildium did not disappoint - It is indeed loaded with a wide array powerful features (that we shall discuss later in this Buildium review). Besides its in-built features, this software offers unique add-on services and extras not found anywhere else. For starters, Buildium.com allows you to accept online payments directly from your tenant's saving account (and it's cheaper than other online payment methods such as Paypal or Moneybookers). A big feature that will appeal to landlords and property managers with more rental properties is the customized webpage that can set up for your tenants. Renters will be able to log into this customized webpage to settle rent payments, request for repairs or stay up to date with latest landlord announcements. The EZ Mailer not only prints lease documents, it even mails them out. Yes we're talking about postal mail here. To be honest, we were already quite impressed at that point but of course we needed to give every feature a thorough test-drive before endorsing it. The seemingly endless list of features offered by the Buildium software is unmatched. There is currently no other online programs under $500 that even comes close to it in terms of capabilities. Buildium goes way beyond the scope of your average property management software. It is a complete system for managing and automating rental tasks from finding new tenants right down to serving eviction notices. If you have 5 or more rental properties, you will soon realize how much time and energy it can save you. As you can see from the screenshot above, Buildium has a clean and well designed layout which makes it easy to navigate and use. 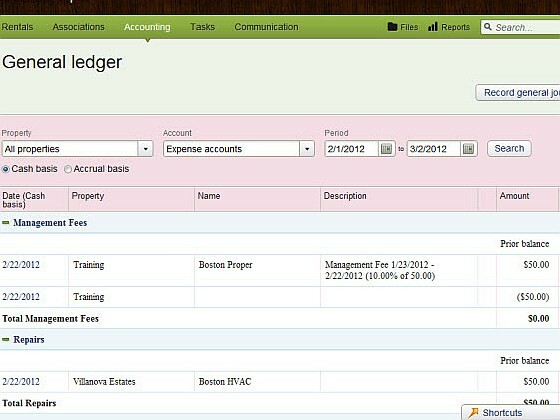 The main features are listed on the green top bar (Rentals, Associations, Accounting, Tasks and Communication). When a software has this many features, one natural worry is that it will become too complex. However this isn't a problem with Buildium. The website has included step by step tutorials in plain English to guide you along. One of the things discovered during our Buildium software review is the clever and automated way it handles rental property accounting. For example: If you enter a repair bill, it automatically updates your expenses. This ensures that your accounting remains accurate plus you won't miss out on any valuable tax deductions later on. Are you ready to uncover more plus points of Buildium and what we don't really like about it?